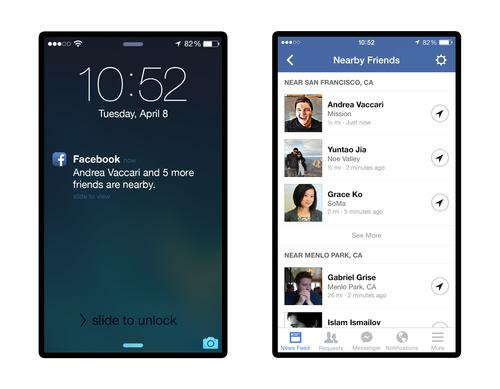 Facebook's Nearby Friends feature provides notifications when friends are nearby. "Nearby Friends," a mobile feature for Android and iOS, lets users share with others their general location, or their precise location for a limited period of time. Those who turn on the feature will be occasionally notified when friends are nearby via a push notification on their device. Users can choose which of their Facebook friends will be notified of their location. Users can turn off the feature at any time. In addition to the notifications, users might see Nearby Friends posts in their news feeds, and they'll also be able to pull up a list of friends and their locations. "Sharing your location with Nearby Friends goes two ways -- you and your friends both have to turn on Nearby Friends and choose to share with each other to see when you're nearby. Your friends will only be able to see that you're nearby if you share this info with them and vice versa," wrote Andrea Vaccari, a Facebook product manager, in a blog post. Nearby Friends will begin rolling out in the U.S. over the coming weeks, Facebook said on Thursday. In addition to placing themselves in a general area, users can also broadcast a specific location, like a movie theater or restaurant, display it on a map and share it with specific friends for a limited amount of time. Facebook hopes the service will facilitate real-life connections and meetups, which seems a nice departure for a site that usually has people glued to their screens. But there are some real privacy implications in providing a constant broadcast of users' whereabouts. Other services like Foursquare and Facebook's own Nearby Places feature typically have users manually share their location when they visit specific places. Facebook hopes to address those privacy concerns in Nearby Friends issues by providing the service only for friends who mutually activate it for each other. Turning the feature on creates a private log in Facebook of a person's location history. Users can clear their location in their settings. Facebook did not say whether advertisements would be included as part of the service, although it's not hard to imagine ads from local businesses eventually appearing. The feature builds on technology from Glancee, a mobile-discovery app developer Facebook acquired in 2012.